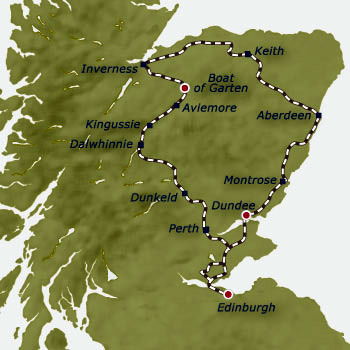 540 miles, including, Dundee, Montrose, Aberdeen, Keith, Inverness, Strathisla and Perth • Optional activities include clay pigeon shooting, fly fishing and a Highland safari • Tour of Strathisla Distillery • Visit Rothiemurchus Estate • Visit Culloden Battlefield. The Belmond Royal Scotsman departs Edinburgh Waverley Station at 13:41 and travels north to the 'Fair City' of Perth. Enjoy afternoon tea as the train continues on the Highland line through Dunkeld, Pitlochry and Blair Atholl with its imposing castle. The rolling hills of Perthshire are replaced by more dramatic peaks and valleys as you enter the Highlands. Sample Scotland's national drink as the Train Manager invites you to an informal whisky tasting in the observation car. In the evening a sumptuous informal dinner is served, followed by entertainment in the Observation Car. After breakfast, you are taken by coach to the historic estate of Rothiemurchus for a taste of wild Scotland. At the heart of the Cairngorms National Park, Rothiemurchus offers a magical setting in which to try outdoor pursuits such as clay pigeon shooting, fishing or guided tour of the estate. Afterwards, enjoy a warm welcome from your hosts as refreshments are served in their hunting lodge and you discover some of the rich history of this family-run estate. Rejoin the train for lunch and travel to Culloden Battlefield, site of the last major battle fought on British soil in 1746. Listen to our Highlander as he paints a vivid picture of how this battle changed the way of life in the Highlands forever. Enjoy an evening visit to Strathisla Distillery, one of the oldest working distilleries and home to one of Scotland's most famous malts, Chivas Regal. Back on board enjoy some spectacular panoramas on the way south through Aberdeenshire and Angus. Dinner tonight is a formal affair as you travel south towards Dundee. A journey south through the former Kingdom of Fife awaits, including the chance to see the magnificent Forth Railway Bridge up close as you return to Edinburgh arriving at 9.46am. Prices are per person and include all table d'hôte meals, all alcoholic and other beverages, all sightseeing excursions as shown in the itinerary and accommodation on board based on two people sharing a twin compartment or one person in a single compartment.